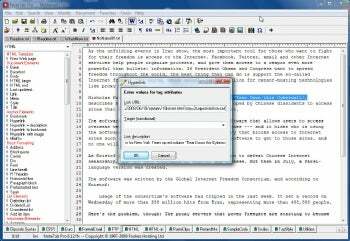 Those who spend a good deal of time coding and are looking for an excellent text editor for the task should give NoteTab Pro ($30, 30-day free trial) a try. It offers a powerful suite of tools that can handle just about any kind of editing and coding task, and is particularly well suited for those who like to code HTML using a non-WYSIWIG editor. If you're looking for a great text editor for coding, you've found it: NoteTab Pro. NoteTab Pro has just about every tool coders want in a text editor: multiple levels of undo and redo; powerful scripting features; line numberin;, bookmarks; the display of non-printing characters; highlighting of URLs, HTML tags, and hyperlinks; and more. In addition to all that, it includes all of the features of its less-powerful cousin from the same author, NoteTab Standard. Coders will probably be most interested in the variety of HTML converters, including those that convert text files to HTML and vice versa. It supports UUEncode and UUDecode, and also handles EBDCIC files. And there are customizable menu shortcuts as well. The upshot? If you want a great text editor for coding, NoteTab Pro is the one to get. Note: There are two other versions of NoteTab available. NoteTab Light which is free but lacks many NoteTab Pro's advanced features. NoteTab Standard is more powerful than NoteTab Light, but lacks features such as multiple levels of undo.